The Automatic Veejay Machine was commissioned by the City of Tilburg for the the new music venue 013 in Tilburg, the Netherlands. With a capacity of 2,200 visitors it is Holland's largest venue for rock music. The Automatic VJ Machine is able to produce an endless series of video edits from videos by 00-Kaap. All the videos are stored in a database, and are linked intuitively with fragments of poetry, manuals, interviews, etc. Using a search engine, the system rapidly selects a number of videos when the user enters a songtitle. 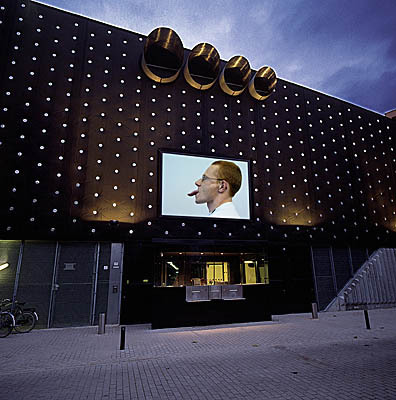 The video sequence is projected onto a large screen in the facade of the building. Visitors queuing up for the box office can see the automated VJ edits. Inside visitors can see the videos via a monitor circuit, this time accompanied by sync sound effects, which are mixed with the music being played inside.